Bimmy and Jimmy, er... Billy and Jimmy are back! Arc System Works is revisiting the 30 year old series with Double Dragon IV. Now, this title may be a big confusing since there was already a crappy 1:1 fighter called Double Dragon V on the SNES, Genesis, and Jaguar (we own it; it's terrible), but this is an all-new game in the NES-era continuity, taking place after the events of Double Dragon II, using the NES series' original sprite art. 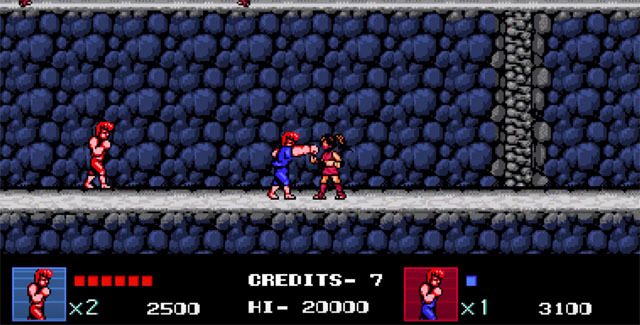 Players can go it alone or team up with a friend to bash in some faces, spin kick gang members, and pummel the occasional Abobo across a dozen stages. There's also an unlockable Tower mode where the player fights groups of enemies, unlocking new characters that can be used in the main game, including regular enemies, bosses, and some unique characters. The game is now available for PC via Steam and PS4 via PSN. Check our coverage here, or get the details in the trailer below, which offers 3½ minutes of obnoxious voiceover.